When you need the ultimate set-up for your outdoor event, you won't go wrong with the 7 Element Wild Rush Obstacle Course. 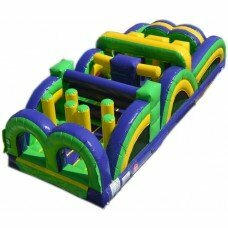 This inflatable has everything your guests will need in an inflatable course. This inflatable obstacle course offers a series of obstacles that are designed to challenge even the most fit individuals. Running, jumping and squeezing through the obstacles, the participants will get it all on this obstacle course. Add a bounce house, slide and interactive game rental, and your event will be awesome! 30' long, 12' wide and 6' high. Want to see a video of this inflatable obstacle course?